So, I’m a Japan chick suffering from a terrible case of homesickness… Never mind that I only lived there for the first 7 years of my life… I’ll forever be an anime baby at heart. And of course, of all the things I miss, I long for Japanese food most of all. 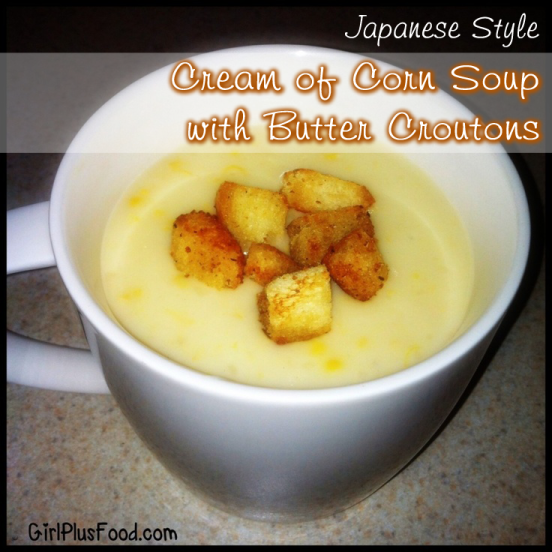 So imagine my excitement when I found several Japanese Corn Cream Soup recipes to experiment with! And after one delicious trial & error after another, I finally found a recipe that made my taste buds very very happy! Over low heat, slowly stir in flour. Add half the chicken stock. Keep stirring to avoid lumps. Add the rest of the chicken stock, bring to boil and simmer for approx. 15 mins. Add milk and salt and heat through. Previous: Chocolate Peanut Butter Ice Cream Pops – EASY Recipe!